Fisher-Price Precious Planet High Chair mom and child will love the Precious Planet High Chair with its entertaining tray toy and must have high chair features. This high chair includes a removable suction cup tray toy to entertain baby while mom is working in the kitchen. The chair features 7 seat height adjustments, 3 position recline, 1 hand removable tray, translucent blue dishwasher safe insert tray, wipeable/washable pad, 4 lockable casters and folding legs for storage. T1455 Fisher-Price Precious Planet High Chair mom and child will love the Precious Planet High Chair with its entertaining tray toy and must have high chair features. 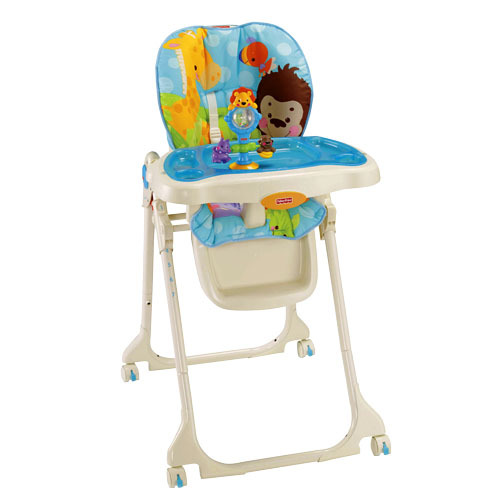 This high chair includes a removable suction cup tray toy to entertain baby while mom is working in the kitchen. The chair features 7 seat height adjustments, 3 position recline, 1 hand removable tray, translucent blue dishwasher safe insert tray, wipeable/washable pad, 4 lockable casters and folding legs for storage. Fisher-Price Precious Planet High Chair Mom and Child will love the Precious Planet High Chair with its entertaining tray toy and must have high chair features. 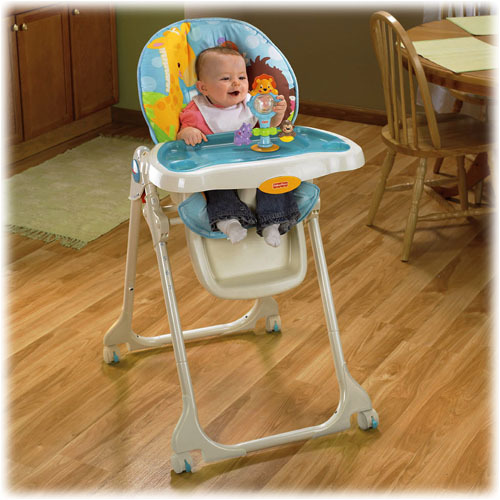 This high chair includes a removable suction cup tray toy to entertain baby while mom is working in the kitchen. The chair features 7 seat height adjustments, 3 position recline,1 hand removable tray, translucent blue dishwasher safe insert tray, wipeable/washable pad, 4 lockable casters, and folding legs for storage. The bright and cheery giraffe and monkey are so friendly and inviting. The little lion (on the tray toy) will entertain baby until her meal is ready. When it's time to eat, the Precious Planet High Chair adjusts to seven different heights and three different reclines for baby's comfort. 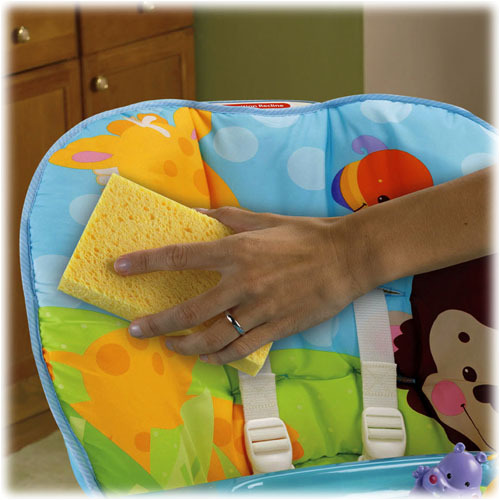 You can remove the tray with one hand, and cleanup is just as convenient, with a spill-resistant pad and a feeding tray (and straps) you can sanitize right in the dishwasher. To Recieve updates and possible rewards for Fisher Price Precious Planet Blue Sky please sign in. To Recieve updates and possible rewards for High Chairs please sign in.